Several months ago, my wonderful friend Donika from Mom! What's for Dinner?, sent a care package full of wonderful treats to try. These were a bit different, as they were Canadian. Some things are the same brand as what we have in the U.S., but they are made a little bit different. And let me tell you, we loved each and every bit of chocolaty goodness! My package arrived just as we were starting our remodeling projects, which was perfect as I wasn't able to do much in the kitchen. 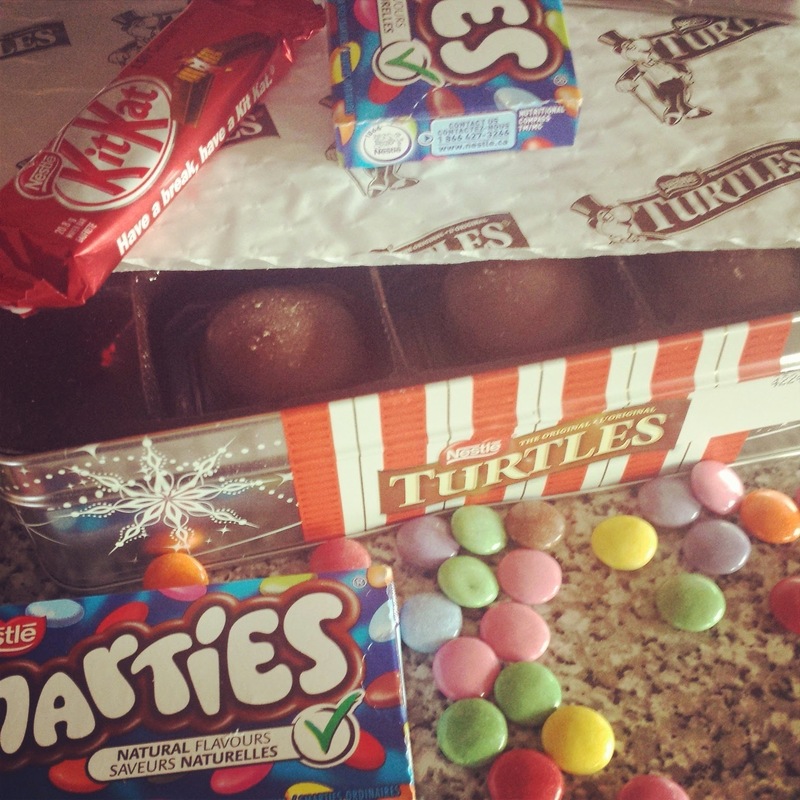 Smarties are my favorite out of everything... If you have a chance, do try them! 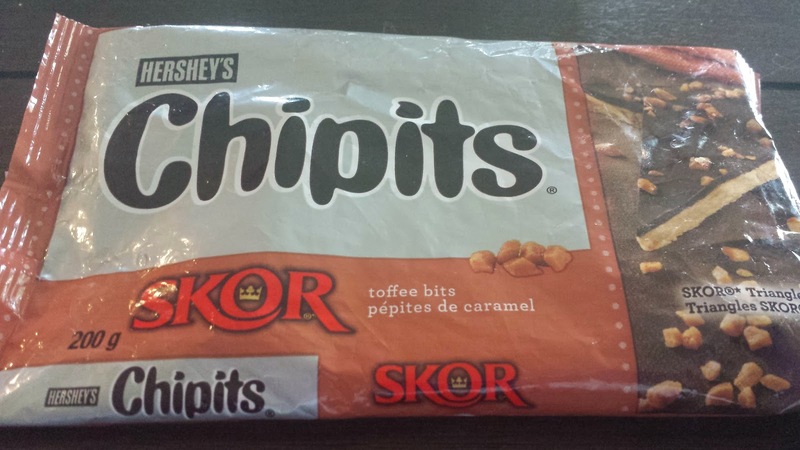 Before we ate our way through the entire care package, I stashed away the the Chipits! I wanted to bake at least one recipe with my Canadian treats. I didn't go crazy and experiment since I had a limited supply. I used the recipe on the bag. These were such a hit. Delicious cookie crust, with toffee goodness everywhere! So, even if you get some U.S. toffee bits, this is a great recipe and makes for a very happy husband! In large mixing bowl, beat butter with brown sugar until fluffy. Add egg yolk and vanilla, stir until combined. Add flour, one cup at a time, until combined. Add 1 cup of toffee bits, stirring until they are evenly distributed through the dough. Press dough evenly into prepared pan. Bake for 18 minutes, or just until beginning to turn golden. Immediately sprinkle chocolate chips over the hot cookie "crust". Let stand for 3-5 minutes, or until chocolate chips are softened. Spread chocolate evenly over top. Sprinkle remaining toffee chips over top of melted chocolate. Let cool for several hours. When bars have cooled and chocolate is set, remove from pan. Cut bars into squares, then cut each square in half diagonally. They are so rich and tempting! I would have problem eating just one or two. YUMMY! What a special friend. All of it looks great. I would love the Kit Kat. This looks really good - the perfect candy to enjoy and gift! Thanks for sharing! I love heath bars and these look just like them! wow what a treat and cut perfectly amazing just amazing!